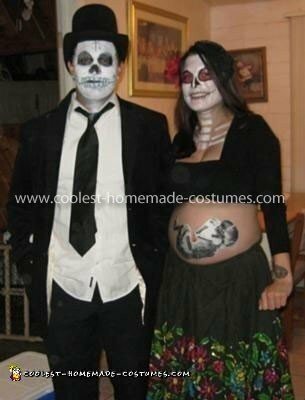 Firstly, I got my idea for a Homemade Day of the Dead Pregnant Belly Costume from going to a day of the dead parade and I was kinda bummed that I was pregnant and couldn’t be a skeleton so I figured my unborn baby could be a skeleton too. So, I Googled baby skeleton X rays and picked one out that seemed right. After I picked the right one I printed it out and cut it out and actually used wood glue because that’s all I had at the time to paste it on me but I recommend a different adhesive. Then I had a bright flowery dress…kind of Spanish Day of the dead looking. Then I put a black tube top on with a small black sweater jacket on since it is chilly during October. Then I got white, black, and red face paint and drew a neck bone and chest bone. I panted my face completely white then did the red around my eyes and used the black around the red to make it look like flower petals and the black paint was also used for my nose and mouth as teeth. If you Google Day of the Dead or Sugar Skulls ideas will pop up and you can choose from there. I also had my boyfriend paint a spine on my back which a lot of people loved. Then final touch ups were a red rose in my hair and a black small bridal veil.